I am writing a novel where the main character is a healer in medieval times / a low-technology environment. Most of his work would involve field medicine, or treating people generally as a village healer. I don't know anything about medicine myself, so what is the best source for me to learn about things like medieval first aid, stitching and closing wounds, herbal medicine, and other medieval medical practices (like stopping infection or the spread of disease)? This is a fantasy novel so there's no specific time period. There are no serious things to deal with (like plagues). Healers mostly use natural/herbal remedies that have been tried and tested by previous healers. Access to original texts has been, until now, largely confined to specialists. Wallis performs the great service of making these writings accessible through accurate and graceful translations. It has an index of topics, obviously useful for finding the specific medical practices you need for your book. Another useful resource is Nancy G. Siraisi's Medieval and Early Renaissance Medicine. In addition to an extensive bibliography (including a list of primary sources which have been translated into English), it also has illustrations showing, for example, surgical instruments and medieval illustrations of people undergoing treatment for a variety of ailments. Googling, for example 'medieval medical treatment', will also give you plenty of images. There is more information on this in the article An illustrated Old English Herbal. The original manuscript can be seen online: Cotton MS Vitellius C III, courtesy of the British Library. Below is a sample image. 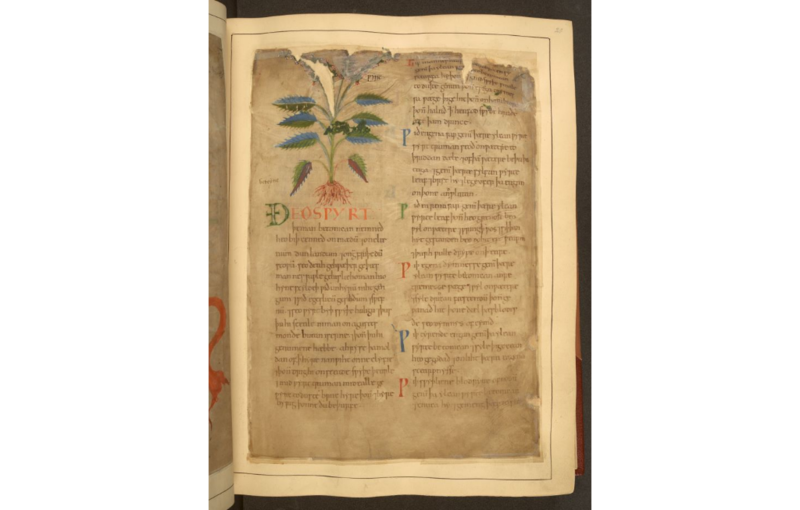 There is a (downloadable) PhD thesis by Emily Kesling, The Old English Medical Collections in their Literary Context which has a section on The Old English Herbarium, among other primary sources. Also available for free is History of Science Society journal article Anglo-Saxon Plant Remedies and the Anglo-Saxons by Linda E. Voigts. 1. The use of prayers / chants / incantations to accompany the 'physical' medicine was common. See, for example, here and also Wallis (cited above). The role of women could be controversial and many peasant women were actually persecuted for practicing medicine. associated with the work of herbalists and wise women, it drew upon the belief that natural objects that looked like a part of the body could cure diseases that would arise there. Lay healers shared medical practice with their religious counterparts. There certainly is not the one best book on this. the setting described is "a village" but most of the primary texts we can study are really high level science texts in comparison. Oral lines of traditions are the ones most frequently cut. We know of ancient medicine from antiquity (VN), presenting us a huge corpus of medical writing, which was the basis or did form most of the 'proper' medical knowledge in medieval Europe. There is clear continuity in this knowledge of the learned strata of society, building up and "standing on the shoulders of giants". But we also know that a substantial amount of practical knowledge was actively disregarded, discarded or which was simply lost. Mainly those of mid-wives, witches, and those farmer's almanach level practices of which we only have hints at in the established texts. And especially the physical methods were widely known and in some cases practised for thousands of years before writing came along (eg Trepanning). That would men to set the cut-off date for such a novel during the renaissance, but include everything we know of from before. Such traditional medical knowledge should be the main focus, while the academic medicine might have been indeed trickling down into the villages, but access and availability might have to be considered. In terms of principal systems to understand, the foremost would be the corpus hippocraticum as completed by Galen which gave us the system of humoral pathology (4-bodily juices). Those need to be in balance and harmony. This is a departure from magical thinking in medicine, but not a complete one: Medicus curat, natura sanat, deus salvat. (The medic acts, nature heals and God saves). The deus part might read as a Christian addition, which it is, but in pre-Christian Europe this were simply other gods and deities to appeal to. Read that as shamanistic practices, praying and sacrifices still play a big role throughout. In terms of diagnostics you'd have to emphasise acute and meticulous observations, like uroscopy, pulse diagnosis (PD), bloodletting (BL), coproscopy (CS), and the same for sweat and sputum. Traditional healers had more at their disposal than just herbalism, but the academic basis for this would be found in works like De Materia Medica. Keep in mind that this is Mediterranean in principle and the higher up North the setting is chosen the less applicable some plants are, as they do not grow there but have to be traded, again a potential problem in "villages". Steve Parker: "Kill or Cure? An illustrated History fo Medicine", DK: New York, 2013. David Wootton: "Bad Medicine. Doctors Doing Harm Since Hippocrates", Oxford University Press: Oxford, New York, 2006. Daniel McCann & Claire McKechnie-Mason (Eds): "Fear in the Medical and Literary Imagination, Medieval to Modern –– Dreadful Passions", PalgraveMacMillan: London, 2018. Thomas Glick & Steven J. Livesey & Faith Wallis: "Medieval Science, Technology and Medicine. An Encyclopedia", Routledge: London, New York, 2003. Luke Demaitre: "Medieval Medicine. The Art of Healing, from Head to Toe", Praeger: Santa Barbara, Denver, 2013. Anne Van Arsdall & Timothy Graham: "Herbs and Healers from the Ancient Mediterranean through the Medieval West. Essays in Honor of John M. Riddle", Ashgate: Farnham, Burlington, 2012. Faye Marie Getz: "Healing and Society in Medieval England. A Middle English Translation of the Pharmaceutical Writings of Gilbertus Anglicus", University of Wisconsin Press: Madison, 1991. Timothy D. Walker: "Doctors, Folk Medicine And The Inquisition: The Repression Of Magical Healing In Portugal During The Enlightenment (Medieval and Early Modern Iberian World)", Brill: Leiden, Boston, 2005. Marcia A. Kupfer: "The Art of Healing: Painting for the Sick and the Sinner in a Medieval Town", Pennsylvania State University Press: University Park, 2003. Sheila Campbell & Bert Hall & David Klausner (Eds. ): "Health, Disease and Healing in Medieval Culture", Palgrave Macmillan: , 1992. Nancy G. Siraisi: "Medieval & Early Renaissance Medicine. An Introduction to . Knowledge and Practice", University of Chicago Press: Chicago, London, 1990. (VN): Vivian Nutton: "Ancient Medicine", Oxford University Press, Oxford New York, 22013. (PD): Evan Bedford: The Ancient Art of Feeling the Pulse. In: Brit. Heart J. Band 13, 1951, p423–437. Emmet Field Horine: An Epitome of Ancient Pulse Lore. In: Bulletin of the History of Medicine. Band 10, 1941, p209–249. (BL): Peter Brain: "Galen on Bloodletting: A Study of the Origins, Development and Validity of his Opinions, with a Translation of the Three Works" K. Codell Carter: "The Decline of Therapeutic Bloodletting and the Collapse of Traditional Medicine", Transaction Publishers, New Brunswick, London: 2012. (CS): Franz Knoedler: "De egestionibus. Texte und Untersuchungen zur spätmittelalterlichen Koproskopie." Pattenesen: Wellm, 1979. (CM): Hildegard von Bingen & Bruce W. Hozeski & Gretel Ehrlich: "Hildegard's Healing Plants: From Her Medieval Classic Physica", Beacon Press: , 2001. As it was classified as "fantasy novel", you really have a huge range of options or inspiration to draw from. If you also look at Byzantine, Arabic, Indic and Chinese medicine. A traveller or trader might bring in some knowledge from there. Parallele devlopment. Besides herbalism, you might also use minerals and metals, like arsenic, quicksilver (mercury) special salts, 'stange' animal products etc. Just like traditional Chinese medicine, ayurveda and so on. Even when going for strict "historical accuracy" in 'good practice medicine' you might be free to include things that would seem like outright quackery. Medics of all times have had strikes of genius for treatments and at the same time did things we would have to classify as pure butchery. Just think of how until recently we had tonsillectomies done routinely or that grandmas still tell you to keep your throat warm so as to not 'catch a cold', and that we indeed have no cure for the common cold. J.C. McKeown: "A Cabinet of Ancient Medical Curiosities. Strange Tales and Surprising Facts from the Healing Arts of Greece and Rome", Oxford University Press: Oxford, New York, 2017. In my opinion, the present state of medical knowledge represents the complete discovery of the art, for it is able to give precise instructions about the nature of diseases and explain the essential aspects of their treatment (Hippocrates Places in Man 46). Many aspects of treatment in antiquity were very stressful and unsophisti- cated (Pliny Natural History 26.16). It is not easy to explain surgical procedures in writing (Hippocrates Joints 33). You should clearly understand that bandaging a broken jaw efficiently does little good, and bandaging it inexpertly does great harm (Hippocrates Joints 32). In seeing the desired cut-off point for knowledge, a great study of writings would be Paracelsus. Deviating from humorism and criticising it loudly, covering a broad range of theory and treatments. Andrew Weeks: "Paracelsus (Theophrastus Bombastus von Hohenheim, 1493–1541) Essential Theoretical Writings", Brill: Leiden, Boston, 2008. For starters, you will not understand Medieval Western European medicine, particularly the popularity of phlebotomy (ie blood-letting), until you understand hemochromatosis, its frequency in NW Europe, and that the only effective treatment even today remains phlebotomy. Contrary to the note in Wikipedia, hemochromatosisis one of the most common congenital diseases in those of Western European stock, approaching 10% incidence in some Irish and Frisian populations. It is possible that the absence of iron-rich macrophages in hemochromatosis sufferers provides increased resistance to certain bacterial infections which feast on those - such as particularly the bubonic plague. However this remains speculative as far as I know. In this opinion paper, we discuss the indications for and monitoring of phlebotomy therapy to achieve iron depletion, maintenance therapy, dietary and pharmacological maneuvers that could reduce iron absorption, and the role of voluntary blood donation. I know Dr. Paul Adams personally, having attended the same high school together. had consistently lied to that person about their blood iron by refusing to recognize the distinction between total blood iron and serum ferritin. I well understand the dangers [of overdoing phlebotomy] - and psychologists understand that the random positive reinforcement is the most powerful kind, inducing a high - hence gambling addiction. None the less, one cannot understand Medieval Western European medicine without an understanding of hemochromatosis - because upwards of 10% of many national populations were afflicted, These days if one's GP can't be trusted, just become a regular blood donor and never worry again. Not the answer you're looking for? Browse other questions tagged middle-ages medicine or ask your own question. What specifc training occurred for members of medieval military orders? What was the main role of alcoholic drinks in ancient to medieval times? What were the required conditions to be accepted by a university in Medieval Times? What techniques were used to make rings in medieval times?